Derry City boss, Kenny Shiels pictured with his son, Dean who has signed a one and a half year deal with the Brandywell club. The North West's worst kept secret was finally confirmed this afternoon as Kenny Shiels was joined at the Brandywell by his son, Dean. The former Rangers and Dunfermline player has agreed a year-and-a-half deal with the Candy Stripes and he will bring some welcome quality and experience to the City ranks. The 33-year old is however unavailable for Derry's trip to Tallaght tomorrow night as is midfielder Aaron McEneff who is suspended. Ben Fisk, unveiled last week as the manager's first signing of the transfer window, can go straight into the side and that at least will give Shiels options ahead of a really tough game. On the downside, the Derry boss confirmed that the Rovers game will be the last for left-back Jack Doyle, whose loan deal from Blackburn Rovers ends tomorrow. 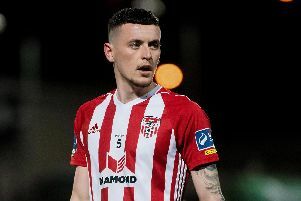 The Liverpudlian has become a real favourite with the Brandywell club's supporters and he will be very difficult to replace in that position. The manager, however, is believed to be working on a number of further potential summer signings and looked ahead to Friday's match as a chance to get back into the race for a European place. "It will obviously be a very tough game but we have to try to fight our way back into the top three or four." "Tallaght is a difficult place to go as we already know but we've prepared well and will go there to try to win the game as we always do." Derry are back in action again on Monday evening as they travel to Belfast for a friendly fixture against Cliftonville at Solitude.